In 1644, Samuel Rutherford, a Presbyterian theologian, published Lex, Rex, the now excessively scarce, enormously important treatise on limited government and constitutionalism. Only four copies have fallen under the hammer within the last thirty-five years. Lex, Rex is the first treatment of rule by law, not by men, based upon the separation of powers and covenant between king and subjects, (foreshadowing the social contract). It laid the foundation for the later thinking of political philosophers Thomas Hobbes and John Locke. As such, this volume sowed the seeds for modern political systems, including that of the United States. "The title, Lex, Rex, is a play on the words that convey the meaning the law is king. When theologian Samuel Rutherford published the book in 1644, on the eve of the revolutions that rocked the English nation from 1645 through 1688, it caused a sensation, and provoked a great deal of controversy. It is ostensibly an argument for limited monarchy and against absolute monarchy, but its arguments were quickly perceived as subversive of monarchy altogether, and in context, we can perceive that it provided a bridge between the earlier natural law philosophers and those who would further develop their ideas: the Leveller movement and such men as Thomas Hobbes, John Locke, and Algernon Sidney, which laid the basis for the American Republic. "This book has long been undeservedly neglected by scholars, probably because it is written as a polemic in the political and sectarian controversies that are distasteful to later generations, and many of its references are somewhat obscure, but a closer reading reveals how it laid the foundation for the contractarian and libertarian ideas that came to be embodied in the U.S. Declaration of Independence and Constitution. 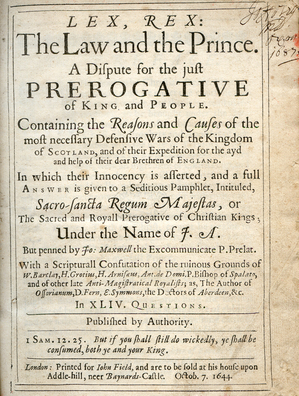 "Rutherford's main idea is that in the politic realm the real sovereign is the people, and that all officials, including monarchs, are subject to the rule of law, a phrase Rutherford uses only once, in Question 26, 'Whether the King be above the Law or no,' but this is the book that developed the contrast between the rule of law and the rule of men. He does not use the term social contract, but does develop the earlier idea of covenant in a way that leads naturally to the idea of the social contract. He also develops the idea of a separation of powers between legislative (nomothetic), executive (monarchic), and judicial functions, in a way that they can balance one another, in a mixed constitutional order that combines the best features of monarchic, aristocratic, and democratic forms of government. "What made the book controversial was Rutherford's argument that not only does the magistrate lose his authority when he violates the law, but that it is a right, and perhaps even a duty, for the people to resist such violations" (Roland Jon. Introduction to Lex. Rex, 2002 edition). Samuel Rutherford (c.1600–1661) "published a number of major works, including Lex, Rex, or, The Law and the Prince (1644), a lengthy and sometimes bitter defence of armed resistance to Charles I. It was written in response to Sacro-sancta regum majestas (1644) by the deposed bishop of Ross, John Maxwell, and drew on Calvinist resistance theory and the political theory of Spanish neo-scholastics. It argued that legitimate government was grounded in a covenant between king and people. Because Charles I had violated his covenant with the Scottish people by trying to force idolatry upon them, they had been duty bound to resist him by force under the authority of lesser magistrates. "The restoration of Charles II in 1660 augured ill for Rutherford. In September the committee of estates issued a declaration against Lex, Rex and copies of the book were burned in Edinburgh and outside New College in St Andrews. Rutherford was deprived of his position in the university, his charge in the church, and his stipend, and was confined to his own house. He was cited to appear before parliament on a charge of treason and his friends feared that he might well face execution. However, early in 1661 Rutherford fell seriously ill. On 8 March he issued a last will and testimony, and near the end of the month he died, at St Mary's College, St Andrews" (Oxford Online DNB). RUTHERFORD, Samuel. Lex,Rex: The Law and the Prince. A Dispute for the just Prerogative of King and People. Containing the Reasons and Causes of the most necessary Defensive Wars of the Kingdom of Scotland, and of their expedition for the ayd and help of their dear Brethren of England. In which their Innocency is asserted, and a full Answer is given to a Seditious Pamphet, Intituled, Sacro-Sancta Regum Majestas, or The Sacred and Royall Prerogative of Christian Kings:... In XLIV Questions. London: Printed for John Field, and are to be sold at his house upon Addle-hill, neer Baynards-Castle, Octob. 7. 1644. First edition. Quarto. 467 (i.e. 435) pp; (A4, a-d4, B-Z4, Aa-Ii4, Kk-Rr2, Ss-Zz4, Aaa-Nnn4, Ooo2; error in pagination: nos. 281-312 omitted). Thanks to David Brass for title page image.